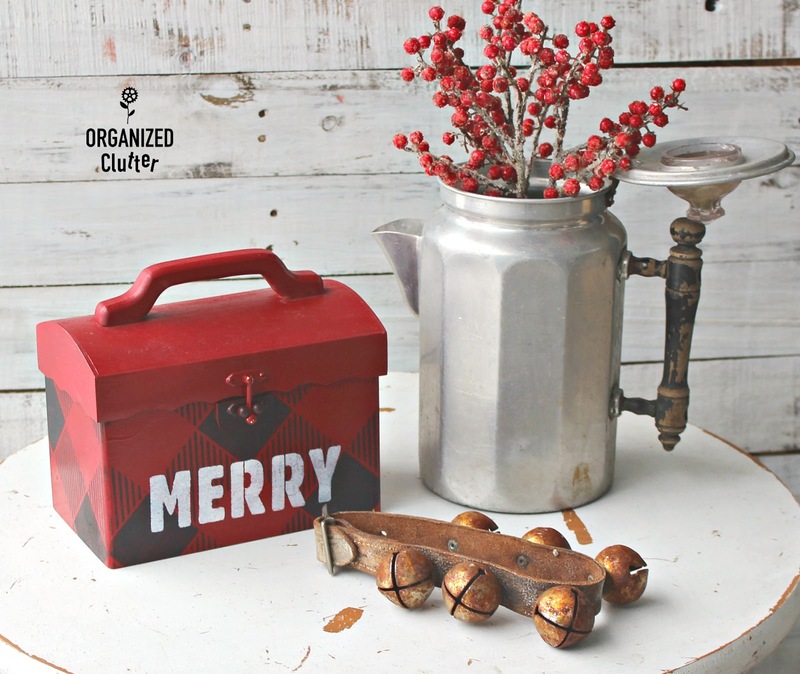 I haven't found very many fun items this year at the thrift shops to up-cycle for Christmas, so I have been busy with more Christmas crafting than Christmas up-cycling. But this wooden hinged box with a handle and a latch caught my eye at the thrift shop, especially since it was red. 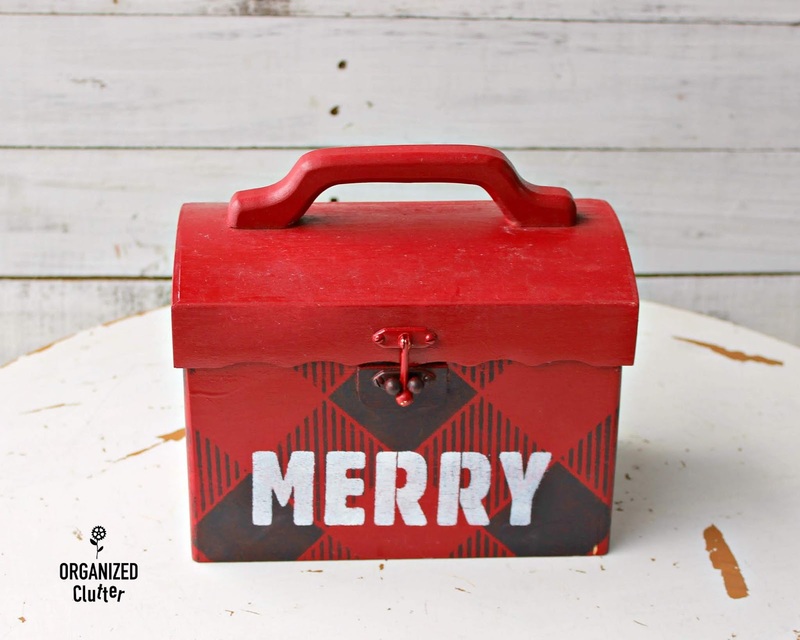 The previous owner had painted the wooden box with a great Christmas red, but with a shinier paint than I would have used. I decided to add a few black buffalo checks to the wooden box using *my Old Sign Stencils buffalo check stencil. 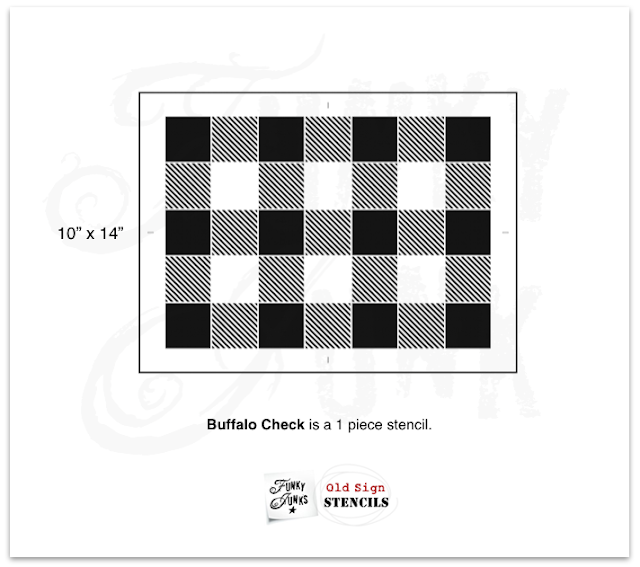 This stencil is so versatile, and buffalo checks are really popular! I lined up my stencil on the diagonal. (My favorite way to use the stencil on small items.) One of the open squares fit perfectly around the latch. I used Fusion Mineral Paint in Coal Black to stencil the pattern. 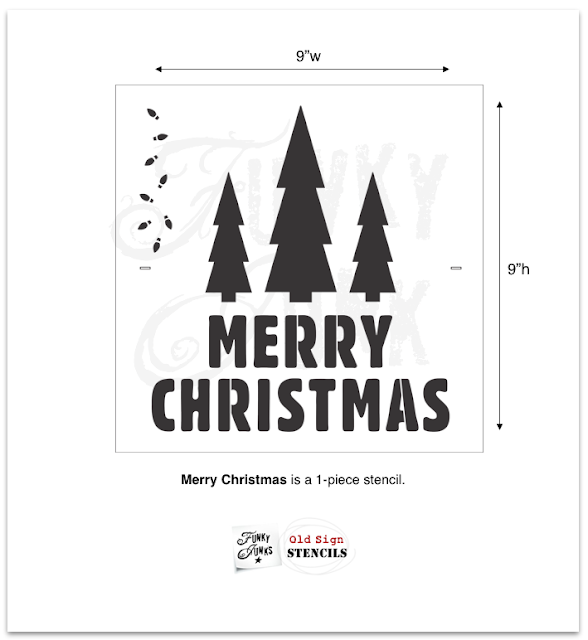 I just received this new *Old Sign Stencils 2018 Christmas stencil. It works perfectly on an 18" or 20" square pillow. If you can't make a pillow, buy a 18" canvas pillow cover from Hobby Lobby or 20" from Ikea. 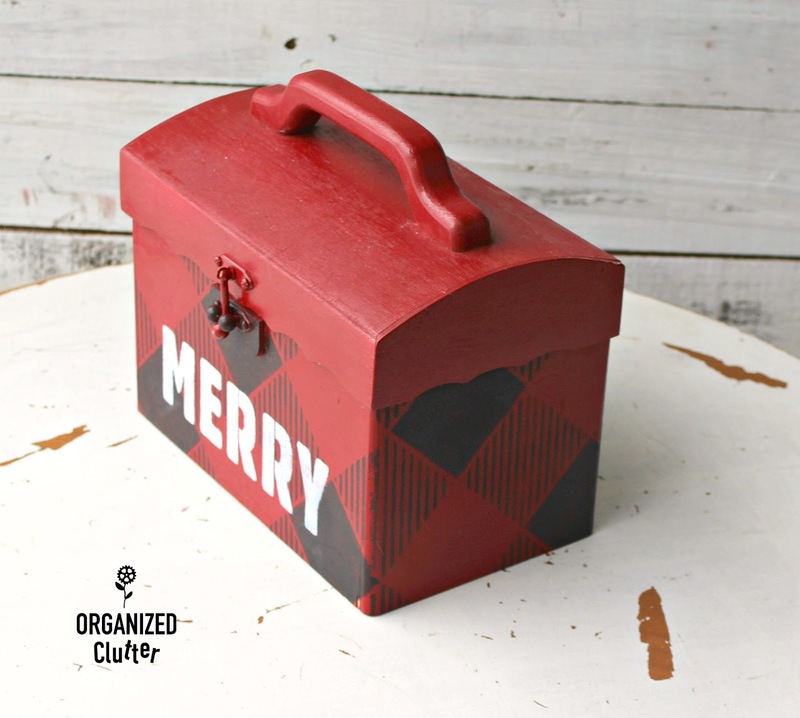 I just grabbed the word "MERRY" to add to my box. That's what is great about accumulating a stencil inventory! You can mix and match! All of the Old Sign Stencils coordinate perfectly. I stenciled on "MERRY" using Ceramcoat white craft paint. I very, very lightly sanded the lettering using 220 grit sandpaper. This is a first! I matched the diagonal pattern from front to sides! I am really getting comfortable with this stencil! I waxed the box with Dixie Belle Paint Best Dang Wax in Clear . The wax is water based and blends in well, and you can apply it with a rag. My hinged box is pretty cute displayed open with Christmas greenery inside too! I have another easy Christmas stenciling project with this old crate. It has pretty chippy dark green paint. I have had this crate for several years. 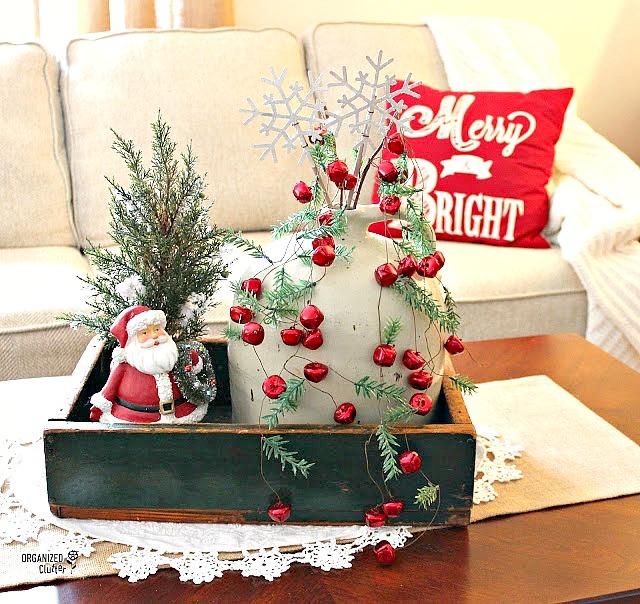 I used it last Christmas on my coffee table for a crate vignette. 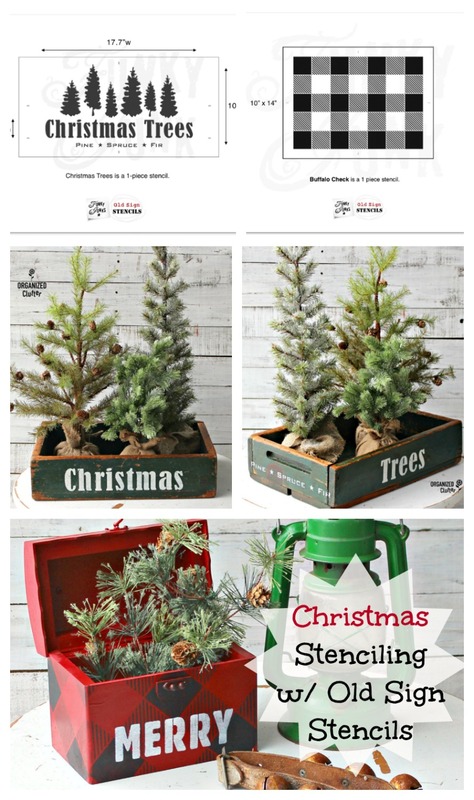 I have never thought of painting the old green chippy crate, but I have considered stenciling it. 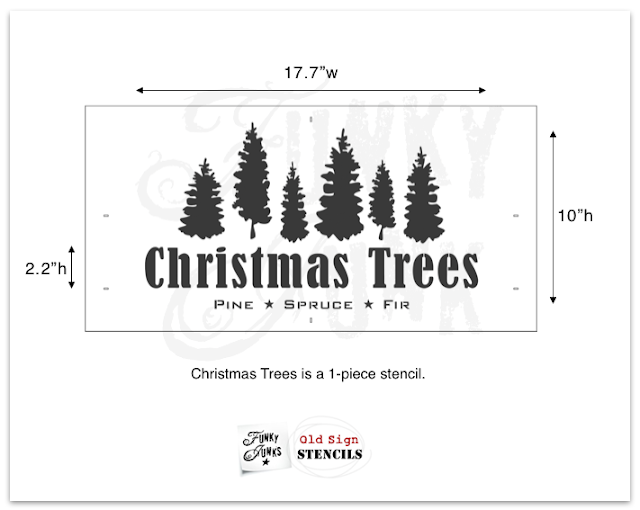 But never more than last Monday, when I received this this new Christmas Trees' stencil from Old Sign Stencils. 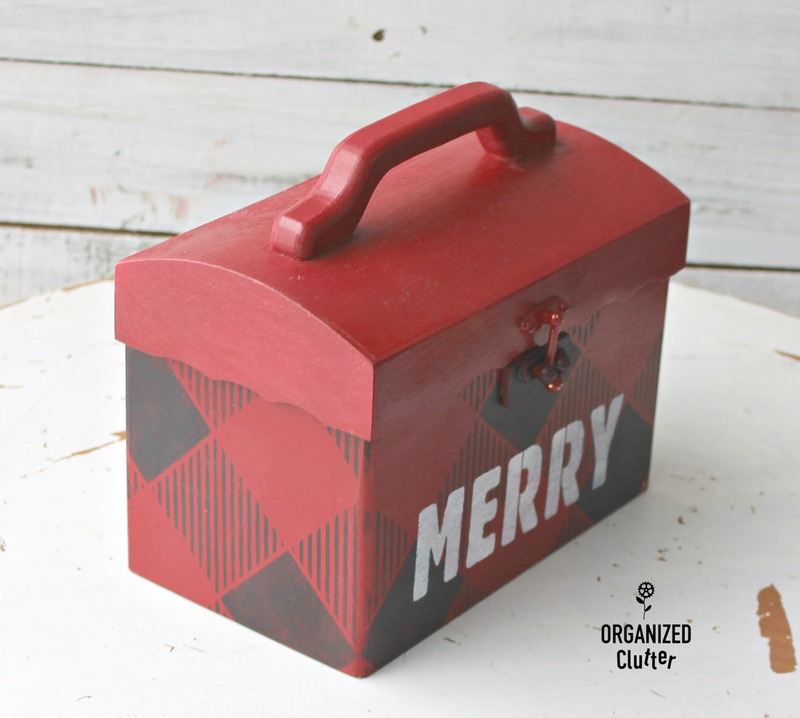 I used Fusion Mineral Paint in Champlain to stencil on the old crate. 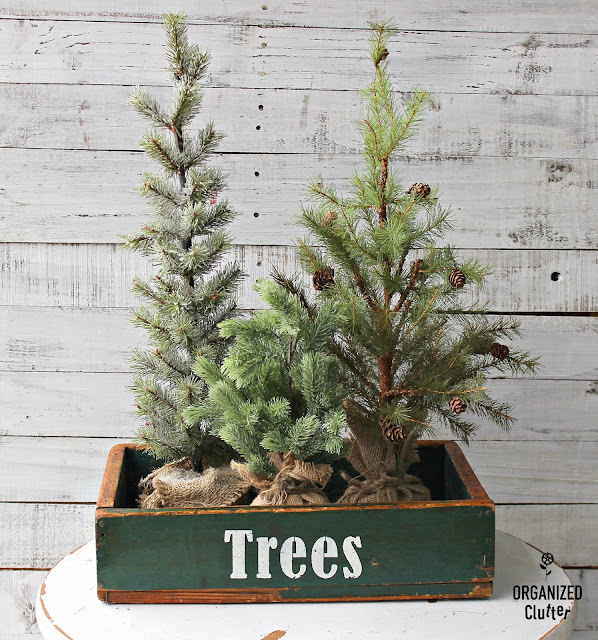 "Pine - Spruce - Fir" on the ends. 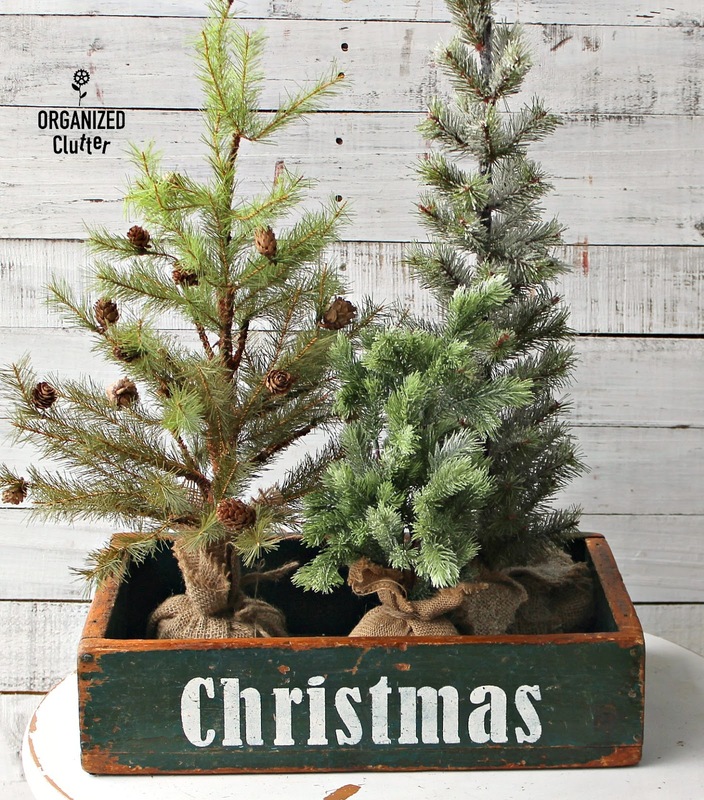 And "Christmas" on the other side. I just love adding stencils to my finds! 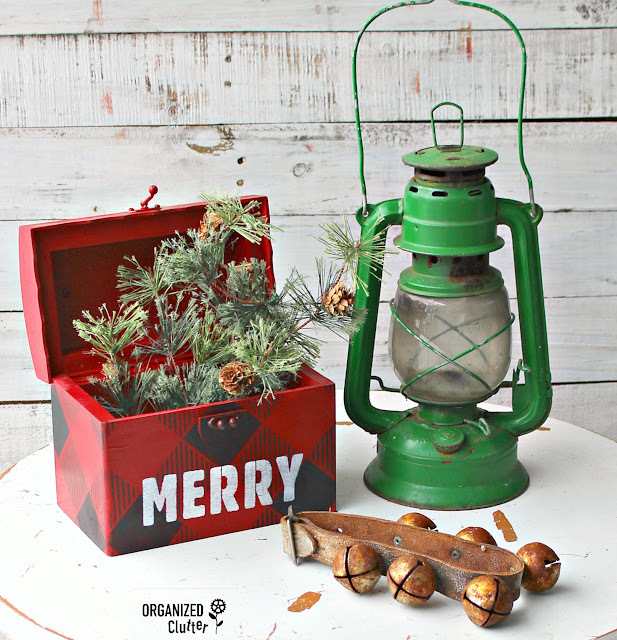 I am so over the moon SMITTEN with these adorable projects! 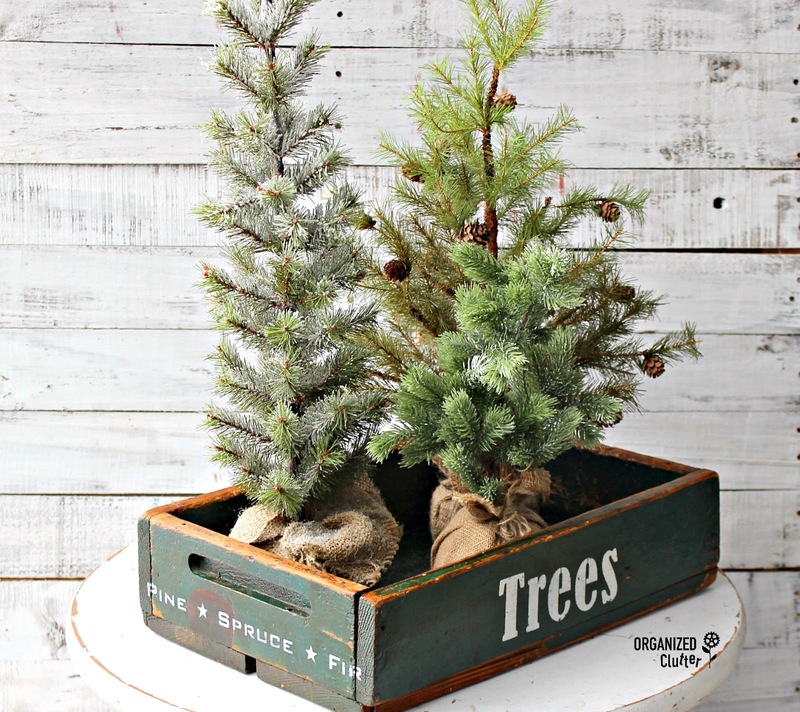 That crate couldn't be any more perfect in size or colour for those trees! And yes, you are mighty comfortable with Buffalo Check at this point. Your images are always so sharp. Thank you yet again for your amazing creativity with these stencils!